There is nothing new about corporate heads and entrepreneurs making good use of every tool at their disposal to start, grow and manage large, bustling businesses. But what is new is that today’s business owners are not necessarily making a mad dash toward growing their businesses to stupendous heights as their predecessors have done. Instead, there is a quiet new trend that is gaining traction, a trend centered around the concept that keeping a business simple and small can bring untold personal and financial satisfaction. But first, what is the advantage of being small? What of the saying, “Go big or go home?” Why start a business that you don’t plan to “grow” at some time? All these questions and more are tackled with precision, care and creativity in online tech guru and business consultant Paul Jarvis’ newest hardback business bible, Company of One: Why Staying Small is the Next Big Thing in Business. 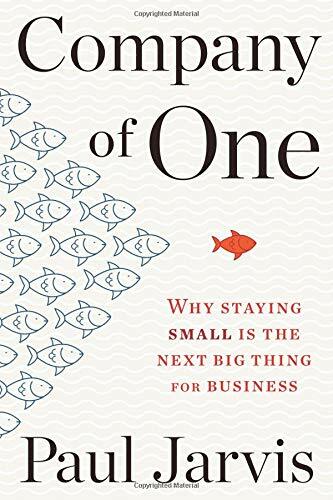 In straightforward, no-nonsense, cut-to-the-chase prose, Mr. Jarvis defines the curious concept of the “company of one,” and then explains how it can be just what a business owner or entrepreneur has been dreaming of. He explains that a company of one has one end goal: to remain small and solve its problems/challenges without throwing “more” into the mix. For example, the typical business model centers around scaling up. When a business does well, the owner/manager assumes that the only way to go is up in order to get “more.” To get “more,” the owner hires more people, builds more infrastructure, adds more processes, and works diligently toward increasing the company’s bottom line. Never mind that “more often equates to more stress, more problems and more responsibilities.” Never mind that more employees means more salaries to be paid, more management needed to oversee the employees, more personalities to deal with, and more . . . well, you get the picture. “More” ends up meaning more red tape, more complexity, more expenses, and more room for mistakes and misunderstandings. In contrast, resisting the urge to grow (staying small) means the ability to be more selective about the types of clients a business owner takes on and the range of products s/he accepts. Staying small means concentrating on the audience the company is already engaging with, not that elusive audience that the company owner hopes to win if s/he “just goes bigger.” It means listening to and helping those who are already sold on the product, who are already engaging with the company. Confused? Consider the cable television companies that, for some mysterious reason, always offer the best deals and discounts to the customers they don’t have. “Possible” customers get gift cards, free one-month or two-month trials, free weekend previews and more if they will only sign on the dotted line. Meanwhile, the cable companies treat the customers they already have as if they have them over a barrel. These loyal customers face long waits when they call customer service, and service charges if they need someone to come out to check their equipment. They never get a discount on a monthly payment, they are no longer eligible for free trials, and they never get free channels for being loyal. They just pay. Yet the prospective, “possible” customer gets all the frills and more—and even reaches a friendly and enthusiastic human customer service representative on the first or second ring. This is all because the cable company wants more, so they roll out the red carpet to get it. For example, when a problem arises in a company, it is easy to throw money at the problem by hiring a company to conduct a study of the problem, or by purchasing some software to tackle the problem, or by hiring extra people to tackle the problem. But the simple solution is to first use the tools or workforce already in place, to be flexible and tackle the problem internally, if at all possible, and to add extra employees on a contractual basis, if at all. Mr. Jarvis explains how “being a company of one lets you control your own life, your own job;” how as the leader of a company of one, you and you alone decide how much money it will take to live the life you want and how much time you will need to spend at your business to earn it. For example, say $150,000 a year is what you’ll need to live the life you want, and you’ve determined that you can earn this comfortably and without too much stress with the clients you have, the services you offer, and the current amount of time you devote. Since you have what you want, you should not strive for “more” just for the sake of getting more. For instance, you should not strive for $175,000, $200,000 or even $250,000 simply because those numbers look scrumptious, because it would take more (more time, more stress, more employees, etc) to get it. As a company of one, you should ask (and answer) the vital question of whether growth is truly beneficial to your company, or whether it will change your personal life and/or add stress to your lifestyle. Company of One is a treasure trove of business tips, ideas and suggestions on how to start the business of your dream and then un-think the typical business model to reach your ultimate goal of staying small. This book emboldens those who have always wanted to strike out on their own but fear they don’t have what it takes; and it also sharpens the business chops of those who have taken the plunge but just need a little push in the right direction. The Table of Contents is sectioned into logical, sequential topics, beginning with the definition of “company of one,” then moving on to what it takes to lead, how to determine the right mindset, and how to find the hidden value in relationships. Mr. Jarvis even includes his own story of how he conceived of and started his own company of one. Entrepreneurs, freelance and trade-published writers, consultants—in fact, any—and everyone who has ever dreamed of starting their own company should read this book. In fact, as bestselling author Cal Newport said, it is a must-read for “any entrepreneur who prioritizes a rich life over riches." It should do well in vocational/occupational courses in high school and trade schools, and can be used as supplementary reading whenever an entrepreneur with a big idea is ready to throw their hat into the ring. Rita Lorraine Hubbard was a special educator for 20+ years with an advanced degree in School Psychology. She is currently a full-time children’s book writer, offering tips to aspiring writers at “Rita Writes History,” a blog that has attracted over 900,000 visitors.